Price includes a one color imprint 1 3/4"w x 1 3.8"h.
ADDITIONAL IMPRINT COLORS - 2 color imprint add $0.10 (P) per piece, 3 color imprint add $0.20 (P) per piece. Large date pad and "Farmer's Almanac" date pads available at an additional charge, both are 12 month pads and pads only are 1 1/2” longer than standard pads. 9 vinyl colors available with standard foil-stamped imprint colors. 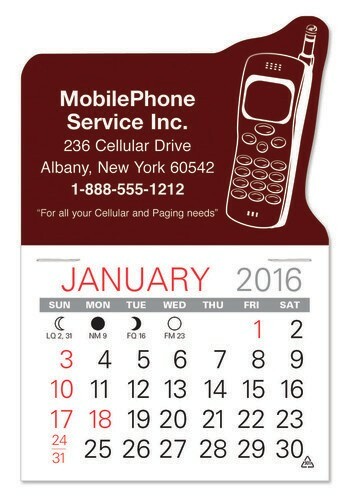 Standard calendar pad has 13 month pad.